@ My favorite local discount store! ***I'm new at buying different cuts of chicken and I'm trying to establish my price book. What do you typically pay per pound for your different cuts? Did I get a good deal? I'd love to know! .79 is pretty good for whole chicken! 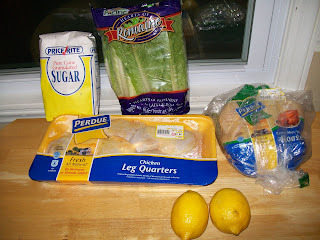 .59 for leg quarters is good...I've seen less...like .29-.49/lb, but it usually requires you to buy a 10-lb. bg. I love the new look. Dh got some sugar for that I hope. Meat is one area I struggle in. If it is reasonable it seems to be in a huge package still costing too much. I think $.79 is decent. Not overpaying at all. Our Kroger had whole chicken $.69 a lb this week but not cut up already like that. We consume one whole chicken per week. Add to that an extra ten pounds of it that are fed to the pets...well, it's a lot of chicken. Probably adds about ten bucks or so per week. I don't like to spend more than $1.29 per pound, regardless of what it is (I pay that for a large tray of split breasts). This week, I grabbed five birds because they were use today or freeze -- .59 cents per pound. I buy backs and gizzards for the dog. Backs are .70 per pound, gizzards, $1.59. I buy the split breasts when on sale so I can cut the bones out and use them (ground up) for calcium in the cat food I make, then I make "people food" with the meat. We make stock from all bones, then take the mushy mess and grind it up to freeze in ice cube trays as a treat for our pup. I skim the fat off of refrigerated stock and use it for cooking and as a spread on dark hearty breads. We eat A LOT of chicken -- because it is the most affordable thing in the poulty/butcher's section. Sorry to be so long -- but you can get more bang from your buck out of chicken as compared to anything else! Sorry for the crazy comments. :) Thanks! I'll have to check it out someday on the way home from work!